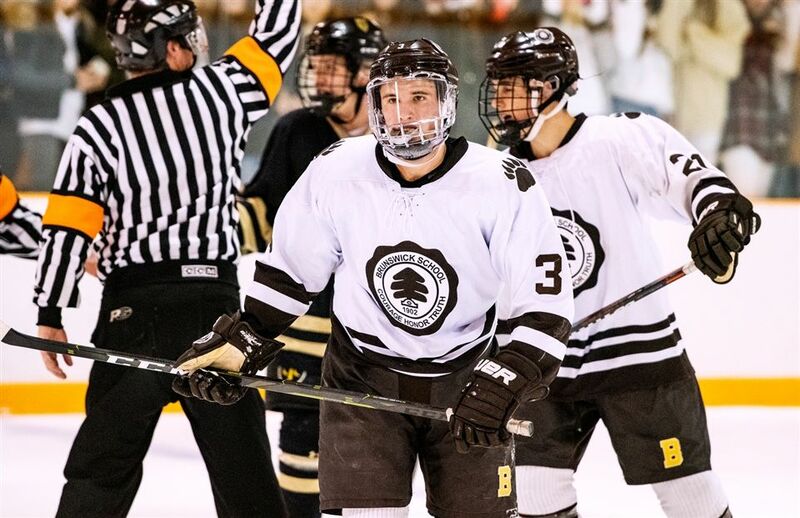 Brunswick rolled over Portledge by an 8-1 margin in Hartong Rink on Wednesday, as eight different Bruins scored a goal in the non-league win. The eight goals match the most scored by Brunswick since an 8-1 win over Taft on January 3, 2018. Brunswick bookended first period goals around a Portledge score for a 2-1 lead after one stanza. Henry Foster opened the scoring with his sixth goal of the year, as Cooper Moore (12th goal) capped the first period with a power-play tally. Goalie Alexander Rohlf (22 saves) made a number of point-blank stops for the Bruins in the first period to keep it a one-goal game. A pair of Bruins notched their first-ever Brunswick goals in the second period. Erik Anderson opened the period with a lamp-lighter at 5:24, as Harry Tavlarios followed with a goal less than a minute later giving the Bruins a commanding 4-1 lead after two periods. Four other Bruins added solo tallies in the third frame for the 8-1 final. Ryan St. Louis’ 13th goal of the season started the four-goal final frame, as Matthew McGroarty (4th goal) made it a 6-1 contest on a power-play tally. Henry Hill and AJ Cerbone each posted their second goal of the season to wrap-up the scoring.